Rosemère, August 9, 2018 – The Town of Rosemère is welcoming two sculptors in residence as part of a public art project that aims to leave two legacies for the 60th anniversary of the Town of Rosemère. 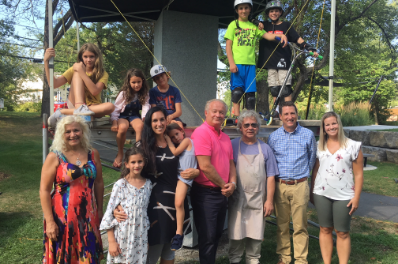 Their two works of art will be created live and specially for the Town, the first one, entitled L'avenir, by artist Jacques Bénard at Place des jeunes, August 6-26 (except for August 13 & 20), at the same location where it will be installed. Then September 9-28 (except for September 17 & 24), at Charbonneau Park, along the waterfront, residents will be able to admire the design of La rose, the second sculpture, by artist Jean-Yves Côté, which will then be exhibited in the library. Both artists will be at work 9 a.m. – 5 p.m.
"With this initiative, we want to showcase art and culture, because it is a great asset to our community. These sculptures will be an outstanding addition to our public spaces and will give residents the opportunity to demystify and learn about sculptors' work, methods and practices all throughout their creation," stated Rosemère Mayor Éric Westram. L’avenir, the creation of sculptor-artist Jacques Bénard, will be three metres high and made of Cambrian granite. This sculpture will pay tribute to young people, who represent the future. In his creative process, Mr. Bénard will use children's drawings, which will be reproduced and engraved in stone. The base of the sculpture will also serve as a bench for passers-by. It will fit perfectly into the decor of Place des jeunes..
As for artist Jean-Yves Côté, he is creating La rose with the theme of "Let it live, grow and blossom". Mr. Côté, inspired by the Town's name, is combining a rose with a prism that symbolizes the effervescence and development of a society in motion and well represents the Town of Rosemère's development over the past 60 years. "It is impressive to watch the creative process and the progress of the artists' work. I invite all residents to come and meet the resident sculptors and welcome them to Rosemère," added Mayor Westram in his closing remarks.